Every year I make a new years resolution that, by the very next day I have seemed to break it. If, by the rare possibility, I do make it past the first day, I always break it by the end of the month. Obviously, I am not very committed to this resolution thing. However, one thing I like to do is a Good thing Jar. For some reason, this year on social media this idea has exploded. What you do is you take a jar, and keep it somewhere special. This jar is the 'good thing jar' ( or whatever you want to call it.) Whenever something good happens you write it on a thin piece of paper, fold it, and put it in the jar. Then on December 31st you open the jar and remind your self of all the good things that have happened to you. Back in October, for my series, "Making Ordinary Time a Little Less Ordinary" I wrote a blog post on this. You can check it out HERE... I might have added a bit more detail here. Faith Can Change a Family! Depending on who you ask, the feast of the Holy Family, has been observed for nearly 100 years. Todays devotional feast day is one that we do not know much of. The body of this feast day comes from the accounts in the Gospels of the events that Mary, Joseph and Jesus are all together (which happens to be only before Jesus starts his public ministry) However, the Holy Family is a the perfect model for all families. It is the example that all families should look to for inspiration and guidance. For Christmas Eve and Christmas day the church gives us four different options for readings and prayers. They are split up into different sections based on the time of the day. For instance, Christmas Day has 3 options: Mass at night, Mass at Dawn, and Mass during the day. The readings for the masses take us on the journey of that most holy evening. The Christmas Gospels begins with the ancestry of Christ going back to Abraham. Then on Christmas day we are following along the journey of the Shepherds. Today the church celebrates the third Sunday of Advent. We have made it past the half way point, and now there is a 'shift' in the season in two main and noticeable ways: firstly we have a shift in the style of readings, and secondly we light the rose coloured candle. That is, today we celebrate Gaudete Sunday. The rose coloured, inspirational Sunday. The word, " Gaudete" translates, from Latin, to " Rejoice." This feast was named on the first word on the Introit, or entrance hymn for this Sunday. In Latin it is, " Gaudete in Domino semper" and in English the phrase is, " Rejoice in the Lord Always" It is this Sunday that we have the rose vestments, the purple is fading into pink and then into white. It is to be a sign for us to stay focused, for the Lord is coming soon. I am for certain that I would have been totally perplexed by the message of John the Baptist. He is the one, coming from a desert, telling us to make low the mountains and to fill the valleys and make straight out paths. If a man did that today, I am sure I would have thought he was crazy. However, John is a unique figure that is defiantly worth imitation. He wears a camel skins and a leather belt- nothing fancy, but rather poor, and non special. But it is the fact that John accepted this role from God. The bible never includes his conception of the job, but surly it is worth notice. He accepted the responsibility of preparing the people for Christ to come. He made wanted all crooked paths straight and every hill levelled and every valley filled. Today we embark on a new journey within the church, the journey of Advent. All the green cloths in the church have been replaced with purple, and the atmosphere has become one of anticipation and excitement. During this time of Advent we have four candles to guide our paths, thinking, and journey. Today, we light the first purple candle; the candle of hope. Advent is surly a time of hope, we are hopeful for the coming of Christ, and his outpouring of graces into our lives. But as post-resurrection people, we already know Christ came and we already know that he will come at Christmas. It's happened already, and we know it will happen again and again. Thats where the challenge of this season begins. 89 years ago, Pope Pious the Eleventh had instituted the feast we celebrate today, that is, The Feast of Jesus Christ the king of the universe. This feast day was instituted at a time when secularism was taking over and Pious added it to refute the modern thinking of the time. Many European leaders had been consumed by there power and had become large, and fierce dictators, and for their purpose, and to define who the real king was, Pope Pious, in an encyclical added the feast of Christ the King to the liturgical year. In my opinion, this feast is needed today just as much as it was back then. New forms of secularism have taken over our society, individualism. The idea that one must do everything and anything for themselves and that only themselves can be in charge of oneself. This is a new form of secularism that has damaged our society to the point of disbelief in Christ Jesus. Today we celebrate the feast of the Dedication of Lateran Basilica in Rome. At first thought, someone might ask, " Why is the dedication of a basilica celebrated throughout the entire church?" that is a very good question and the answer isn't a short one. At the beginning of the fourth century, Christianity saw the light at the end of the tunnel. That light was the Roman emperor Constantine. For the past two hundred years Christians were being persecuted under different extremes by the Roman Empire. Constantine had made Christianity legal again and helped make it the official religion of the empire. During his time as emperor, Constantine built many churches; one of them being, St John Lateran Basilica. An interesting fact is that there is no actual saint named, " St John Lateran" Rather, it was named after St John the Evangelist and St John the Baptist. I find that the most ironic part of this entire series is that their is NOTHING Ordinary about Ordinary time. The title of this series was simply a play on words. One of the many things discussed and decided upon at the Second Vatican Council was that the period of time between Christmas and Lent, and Easter and Christmas, which had no name, would now be called, " Ordinary time" Or " Numbered days"
Today we celebrate the feast of All Souls Day. We pray and remember the people whos 'life [has] changed, not ended' (Preface of the Dead I) We pray the God will be with them and grant them peace and joy in his heavenly kingdom. The Gospel from John today expresses Jesus journey to his Cross. Whenever Jesus speaks about being glorified he is speaking about his death; the ultimate sign of his love for us and his commitment to Gods unfailing will. Jesus initiates the conversation with this remark, " The hour has come for the Son of Man to be glorified" His life is short, and he is talking to his disciples about it and how they can join him in heaven. "Unless a grain of wheat falls into the earth and dies, it remains just a single grain, but if it dies, it bears much fruit"
God is like a dog. I have two dogs, one which is just about 2 years old, and another that is just about 8 years old. As you may expect, there are two very different personality mixes in these dogs. The young one being hyper and annoying, and the older being calm and relaxed. God is like both of these dogs. My younger dog will stop at no ends to get your attention. She will continue to come closer and closer to you, until there is no possible room left for her to cuddle closer. At times this is cute, and at other times it is just annoying. But regardless of how many times I tell her to go away, or I gentle push her away from me, or get mad at her, she always comes back. She always returns the next hour wanting more attention. Just like God. We may tell God to 'go away' or 'leave me alone' but God will always continue to love us. Each year can go by very fast and we can loose track of things that are important. Through out the year we can get distracted by a big project, or by sorrowful news. It begins to seem like the year has slipped right past us, and we are wondering where the year just went. Today, I would like to suggest to keep track of the delightful things in life with something called a Gratitude Journal. What you do is that every time something good happens to you, take out your book and write it down. The challenge is to try to do this everyday because, even on the toughest of days their is always something to be grateful for, even if it was a simple smile from someone. At the end of year, on December 31st, flip through your journal and recall all of the good things that happened to you throughout the year- relive the good moments of the year. The last three weekends Gospels have been about Jesus preaching the reality of the Kingdom of Heaven to the Pharisees and scribes. As the readings of the Gospel of Matthew come close and closer to a close, we are beginning to hear more scripture passages that occur closer to Christ's death and Passion on the cross. As so, as this time comes closer and closer, we begin to see the Pharisees try harder and harder to trap Jesus into saying something that is judgemental by the law. For the past two weeks we have been hearing parables about the Kingdom of Heaven that Jesus has been directing to the Scribes and Pharisees. Today we conclude with the third and final one in this set. Jesus started off by teaching that you must practice what you preach, (parable of the two sons) then Jesus talked about their (the Pharisees) rejection of the truth, John the baptist, and himself, and finally Jesus teaches that the kingdom of God is like a banquet prepared for all those whom believe. In Canada, this weekend, we celebrate thanksgiving. The wonderful feast of family, happiness, gatherings, and food. I find it very special that todays' feasts described in the readings land on a feasting weekend for Canadians. How much is a little? What are you blind from? Whom are your praying for? 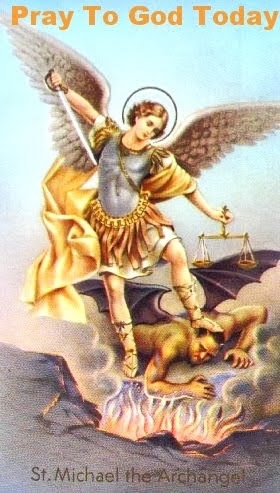 Saint Michael The Archangel Page! This site is copyrighted 2018. MUST GET MY PERMISSION TO USE ANYTHING OFF THIS SITE!